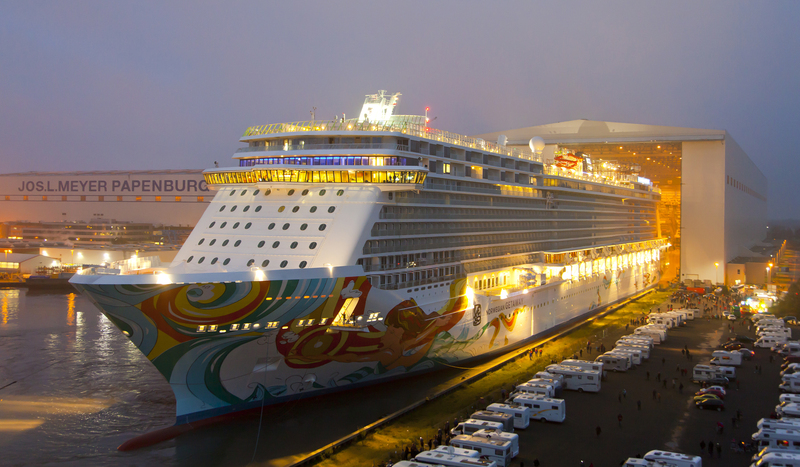 Norwegian Getaway, with its brightly painted hull, brought a taste of Miami sunshine to the British port of Southampton this morning on its inaugural voyage. The £520million German-built ship, a sister to Breakaway launched last year, arrived at 9am for a two-day stay before heading across the Atlantic to New York. Norwegian Cruise Line’s latest arrival has a Miami theme from its hull artwork to its ice bar. As well as the Hollywood musical Legally Blonde, it boasts an an ‘Illusionarium’ featuring magic, illusions and supernatural effects. Though it might be too cold to enjoy in Southampton, there is a three-storey sports complex and aqua park with five waterslides, two swimming pools and a ropes course with 40 elements, including a zip wire. Like Breakaway, it will feature the Plank, which extends 2.5m (8ft) over the sea. Children will be able to meet Nickelodeon stars such as SpongeBob SquarePants and Dora the Explorer. And, of course, there is no shortage of food with 27 dining options. There will be ‘inaugural celebrations’ tomorrow, though the formal naming will not be until February 7 in its homeport of Miami. I will be boarding today (with swimming shorts, just in case!) so do follow me on @shipmonk on Twitter for news and photos. This entry was posted in New ships and tagged arrival, Breakaway, Norwegian Cruise Line, Norwegian Getaway, sister, Southampton. Bookmark the permalink.